Utah’s stunning red rock canyons, where the river meanders slowly through twisting walls and quiet solitude, are the perfect setting for family rafting trips in Utah. Leave the world behind and focus on reconnecting with your kids as they relearn how to play and enjoy nature without all the distractions of modern technology. 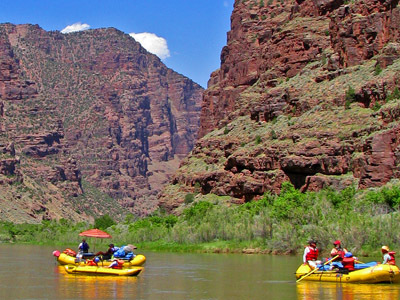 A Utah river rafting trip is an experience not to be missed. Many people who went Colorado River rafting or Green River rafting with us as children later told us through letters and on return trips that those early experiences impacted them in ways they never expected. Our guides say these responses make all their hard work worth it. The amazing scenery, the exciting river and the backcountry camping can change one’s outlook on life and redefine what’s important in a child’s young mind. As a parent on a family river rafting trip, you’ll sit back and relax as the guides handle everything, from setting up a comfortable camp to cooking scrumptious meals to helping your children interact with each other and their beautiful surroundings. 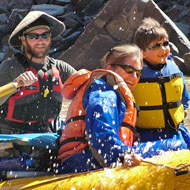 Some of our guides have more than a decade of experience leading family rafting trips in Utah. Each one has their own “bag of tricks” to help children stay engaged and amazed while on the river. Parents constantly tell us our guides went above and beyond their expectations. We’ll get everyone together on a kids’ raft where they’ll laugh through water fights, listen to stories about the canyon and stay completely engaged with their surroundings. We’ll keep them hydrated and covered in sunscreen, watch them swim safely, lead interactive games and keep them entertained so you can relax. Young children will have an endless supply of pristine, soft beaches, sand toys and warm water for hours of creative fun. Older children can play horseshoes or bocce, and hike into lush canyons filled with interesting plants, wildlife and history. The days rush by like the powerful river that is never far away, teaching, entertaining and making memories to last a lifetime. There are activities on the water as the paddleboats, oarboats and inflatable kayaks float through the best scenery in the American West. Sometimes, the best moments on family river trips are simply sitting quietly and contemplating the awe of nature. We provide healthy, kid-friendly meals and snacks throughout each day. Expect more than hot dogs and potato chips. Our meats and cheeses are chosen from a local deli. Produce is picked from our own home-grown garden. Guests and guides regularly say river cuisine is better than what they eat at home. After dinner each evening, sit back and watch the afternoon light quietly set on a sheer canyon wall over the soft, sparkling river. Shadows move slowly into camp as the day’s events are recounted and stars begin to pop into our own sliver of clear night sky above the silent canyon. These moments are precious, the experience not to be quickly forgotten. After dark, settle down into comfortable, clean tents and sleeping bags. Our camps each day are set up with separate kitchen, living, bathroom and sleeping areas so everyone is comfortable. The guides teach nature skills, safety skills and comfort tricks to help you become an expert backcountry camper on family rafting trips in Utah. 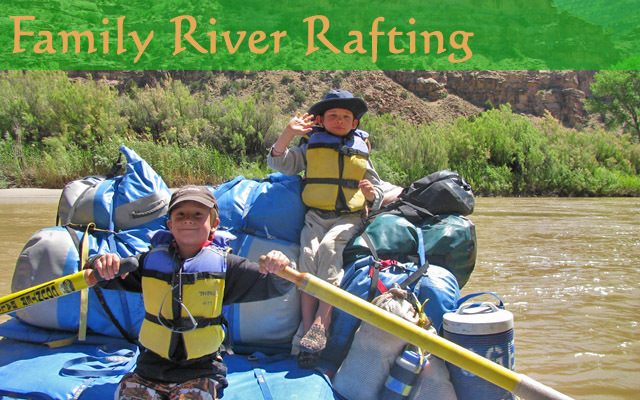 Our signature family rafting trip in Utah is the 5 day/4 night “Family Rafting" expedition on the Green River. This great Utah river rafting vacation offers exceptional bonding opportunities, plenty of moderate yet fun whitewater for children ages 5 and up, charming campsites on sandy beaches, stunning geological features and ancient and recent Western history. This Green River rafting adventure begins with a scenic flight to the launch site! Our 4 day/3 night Gates of Lodore family river rafting trip on the Green River is one of the most popular at Sheri Griffith River Expeditions. It combines all the elements of a classic Utah river trip with great hikes, exciting whitewater, beautiful beaches and colorful history. Join us for this journey into a spectacular wilderness area! This trip offers lots of activities and action for everyone in your family ages 10 and older.